18:0.9 These beings of administrative perfection are of definite and final numbers. Their creation is a past event; no more are being personalized. 18:0.10 Throughout the grand universe these Supreme Trinity Personalities represent the administrative policies of the Paradise Trinity; they represent the justice and are the executive judgment of the Paradise Trinity. They form an interrelated line of administrative perfection extending from the Paradise spheres of the Father to the headquarters worlds of the local universes and to the capitals of their component constellations. 18:0.11 All Trinity-origin beings are created in Paradise perfection in all their divine attributes. Only in the realms of experience has the passing of time added to their equipment for cosmic service. There is never any danger of default or risk of rebellion with Trinity-origin beings. They are of divinity essence, and they have never been known to depart from the divine and perfect path of personality conduct. 18:2.3 Except for the established orders of life, such as the Havona natives and other living creatures of the central universe, the resident Eternals of Days have developed their respective spheres entirely in accordance with their own personal ideas and ideals. They visit each other’s planets, but they do not copy or imitate; they are always and wholly original. 18:3.4 The Ancients of Days were all trinitized at the same time. They represent the beginning of the personality records of the universe of universes, hence their name—Ancients of Days. When you reach Paradise and search the written records of the beginning of things, you will find that the first entry appearing in the personality section is the recital of the trinitization of these twenty-one Ancients of Days. 18:6.1 The Trinity personalities of the order of “Days” do not function in an administrative capacity below the level of the superuniverse governments. In the evolving local universes they act only as counselors and advisers. 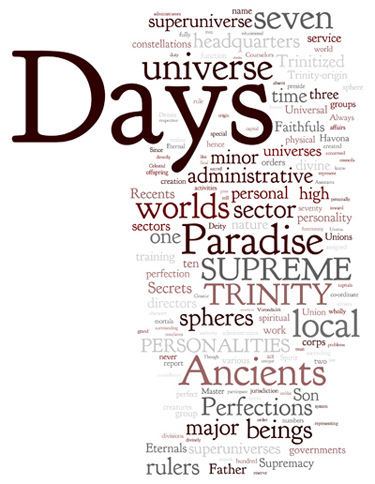 The Unions of Days are a group of liaison personalities accredited by the Paradise Trinity to the dual rulers of the local universes. Each organized and inhabited local universe has assigned to it one of these Paradise counselors, who acts as the representative of the Trinity, and in some respects, of the Universal Father, to the local creation. 18:7.2 All that a Union of Days is to a Creator Son of a local universe, the Faithfuls of Days are to the Vorondadek Sons who rule the constellations of that local creation. They are supremely devoted and divinely faithful to the welfare of their constellations of assignment, hence the name—Faithfuls of Days. They act only as counselors; never do they participate in administrative activities except upon the invitation of the constellation authorities. Neither are they directly concerned in the educational ministry to the pilgrims of ascension on the architectural training spheres surrounding a constellation headquarters. All such undertakings are under the supervision of the Vorondadek Sons.